Successfully Added 360 Degree Wi-Fi Action Camera - 1/4 Inch CMOS Sensor, 1280x1024 Resolution, Four Shooting Modes, SD Card, Panoramic (Black) to your Shopping Cart. Coming in a cool black finish this mini action camera has 4 different shooting modes. record in hemispherical mode, circular mode, segmentation mode or panoramic mode, so you can enjoy great versatility and get incredible shots. With its 1/4 inch CMOS sensor you get HD 1280 by 1024 resolutions at 28 frames per second letting you relive the content in immersive detail. The cameras Wi-Fi functions allows you to connect not one, but two devices simultaneously. Both Android as well as iOS devices are supported on the GVT360I app. This makes it easier than ever to share and review your shots and upload them via your phone, computer or tablet PC. A built in 1300mAh battery bring up to 3 hours of usage time and with H.264 video compression you will be able to get the most out of the 32GB micro SD card support. Coming with a full host of adaptors and accessories you can mount the camera on your bike, tripod, helmet, and just about anywhere else you could think of. Get prepared for your next adventure and rather than the same old boring flat shots pick up this 360 degree wide angle action camera for a different perspective of the whole experience. 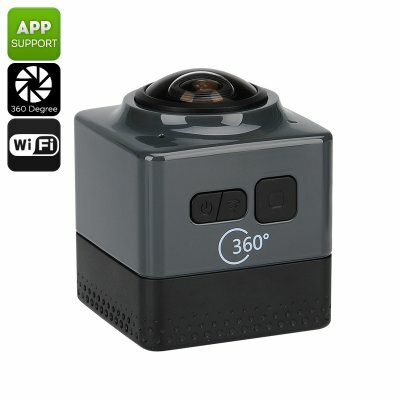 The 360 Degree Panoramic Action Camera comes with a 12 months warranty, brought to you by the leader in electronic devices as well as wholesale action cameras..